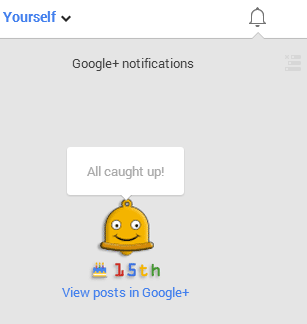 Mr. Jingles, the Google+ notification mascot, celebrates Google's 15th birthday with a pixelated animation. 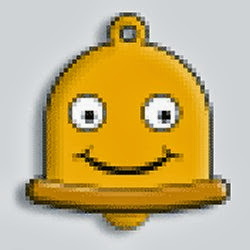 Just click the bell icon, read all your notifications or click "mark all as read" to see it. "Friends of mine here at work found this old photo of me from back in 1998, the same year Google started up. Yes, I know I was a bit awkward back then – but so was Google (check out this link for proof). Anyways, enjoy this retro version of me in your Notifications tray for the next day or so. Oh, and Happy Birthday, Google!" Mr. Jingles also changed its profile photo: "A little change of pace in my profile photo for #throwbackthursday.". The file name is self-explanatory: "1998-jangles-avatar.png".